*The transfer from Anchorage to the port in Seward is a coach transfer from the Egan Centre as provided by Azamara. Please contact us for other transfer options. Set on the shore of Lake Spenard next to Lake Hood, The Lakefront Anchorage is the only hotel in Anchorage that is located on a lake. Our scenic hotel has daily flightseeing and fishing pickups from its own dock, from which you can also gaze at floatplanes with the majestic Chugach Mountains behind. Getting here is a breeze: the hotel is conveniently located near Ted Stevens Anchorage International Airport, with downtown Anchorage just four miles away. Hyatt Regency is located in downtown Vancouver, overlooking a mountain- rimmed harbor, adjacent to exclusive shopping in Royal Centre Mall and Sky Train Station, 2 blocks from Pacific Center and Robson Street, sports complexes, theatres, convenient to 1000-acre Stanley Park, Granville Island and Grouse Mountain - the largest aerial tramway for skiing and recreation in Canada. The hotel is 20 minutes to Vancouver International Airport. 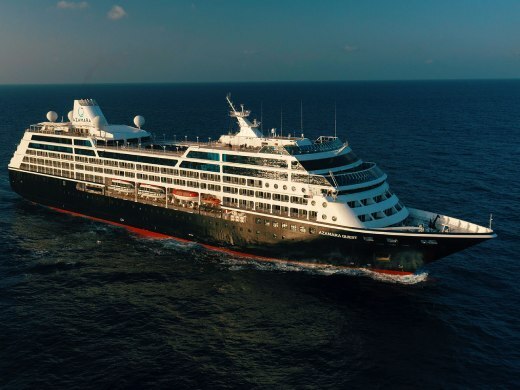 Azamara Quest specifically designed to be smaller and more sleek than most cruise ships, Quest, like her sister ship, Journey, is filled bow-to-stern with wondrous luxuries and appointments that enhance your voyage of discovery-making it one that you won't soon forget. There's a timeless romance that begins when you wander aboard Azamara’s ships. Because it's easy to fall for Azamara’s well-appointed amenities, impeccable service, gourmet cuisine, and warm and inviting atmosphere. So, give in and enjoy your every indulgence. You'll love how Azamara makes you feel. Each ship offers more of what you desire. Both are specifically designed to be smaller than most cruise ships and filled bow-to-stern with wondrous luxuries and appointments. And with just 694 guests onboard, you’ll discover a more intimate way to travel. See for yourself how truly remarkable an Azamara voyage can be.